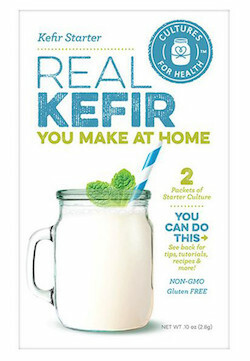 Make kefir at home with this powdered starter culture. With no grains to maintain, this culture is easy to use to make homemade kefir at a much lower cost than buying kefir at the store. And it's delicious! Drink plain, add flavoring or use kefir in your favorite recipes. Ingredients: Proprietary blend of selected strains of lactococci, lactobacilli, Leuconostoc, and Saccharomyces fragilis bacteria. May contain trace amounts of soy and milk. Use 1 packet with 1 quart dairy milk, juice, or coconut milk or coconut water. Shelf life: Room temperature: 3 to 4 weeks, refrigerator: 6 to 12 months. Avoid using ultra pasteurized or UHT milk. Cultures on the counter top at 72-74ºF.